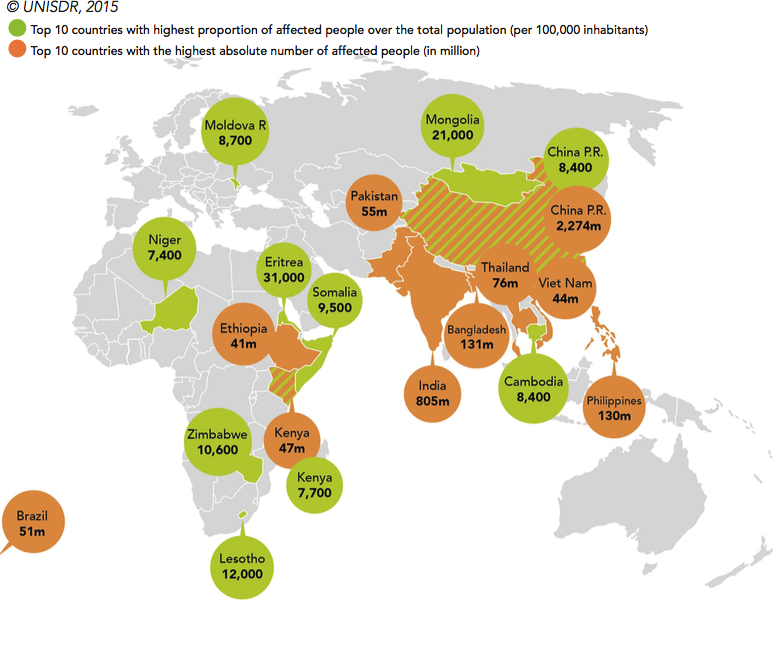 Figure 2 from page 3 of the brief: Countries most affected by weather-related disasters (1995-2015). Copyright: UNISDR, 2015. Climate variabilities are intimately linked to a range of diseases caused by heat stress and to the transmission of infectious diseases attributable to altered environmental conditions. In addition, extreme weather events such as droughts, flooding and hurricanes have health consequences ranging from death, injuries and mental illness to malnutrition due to crop failure. Being strongly interlinked with both human health and the climate system, the environment acts as a major mediator in the climate-health nexus involving air pollution and climate-related effects on infectious disease occurrences. A broad range of plausible interactions among environmental, social and behavioural factors makes the attribution of health outcomes to climate change complex, but the scientific consensus holds that the climate change effects on human health are predominantly adverse. Climate change is mainly expected to exacerbate existing health hazards among populations that are currently affected by climate sensitive diseases. In addition, existing diseases may extend their current range and new conditions may emerge. This nexus brief* sheds light on the complex interaction between climate change and health outcomes, discusses policy responses in a development context, and identifies the environmental determinants that mediate climate impacts on human health. While the general concepts are illuminated from a global perspective, the main focus is devoted to how the climate-health-development nexus manifests itself in low- and middle-income countries. *Download the full text from the right-hand column. This publication is also available to download in French and Spanish (see Further Resources). Key messages from the brief are provided below. Figure 1 from page 2 of the brief: Three pathways by which climate variability and change affect human health. Adapted from IPCC (2014) and Butler et al. (2010). For more detail right-click to open in new window/tab. Climate variability and change are intimately linked to human health. Apart from health effects such as heat stress caused by direct climate exposure, climate impacts on human health are typically mediated through natural systems (including vector-borne or waterborne diseases) or caused by disruptions of social and economic systems, as in the case of undernutrition. Poor people are particularly vulnerable to climate change due to low adaptive capacities and limited resources to cope with climate-related health threats. Thus, ongoing changes in climate patterns and the resulting implications for human health are expected to put a strain on livelihoods in low-income countries. In the absence of appropriate policy responses, the consequences can hinder global development efforts as stipulated in the United Nations Sustainable Development Goals (SDGs). Although some health impacts of climate change are favourable, the negative effects from climate change on health are generally expected to outweigh the positive ones. The World Health Organization (WHO) estimates that between 2030 and 2050, an additional 250’000 deaths per year will be attributable to climate-associated increases in malnutrition, malaria, diarrhoea, and heat stress. The most promising adaptation measures for reducing future vulnerabilities to climate change are climate-sensitive improvements in essential public health functions. In this respect, ongoing efforts to strengthen health systems in low- and middle-income countries provide a crucial contribution to protecting health from climate change. Health systems should also increasingly integrate specific climate-conscious interventions. The most alarming health-related outcomes of climate change are expected to be increased risks for food insecurity and undernutrition, both of which carry important implications for social development and political stability. This climate-health-security nexus calls for international support that builds resilience to climate stresses, and that should increasingly target health systems in politically fragile and climate- vulnerable countries. The fact that the health impacts from climate change are strongly interlinked with environmental and social systems provides an opportunity to leverage the benefits of adaptation and mitigation measures through inter-sectoral collaboration. Figure 3 from page 5 of the brief: Summary of major effects of climate change on human health. Adapted from IPCC (2010). Lechthaler, F. and Wyss, K. (2017) Health. Climate Change & Environment Nexus Brief. Swiss Agency for Development and Cooperation: Bern, Switzerland.